Everyone wants that Hollywood smile, however not everyone is lucky enough to be born with perfect teeth. Chips in teeth, irregular shapes, and discoloration of teeth are not uncommon and can make people hide their smiles or feel uncomfortable. Therefore, if your teeth make you self-conscious for any reason, dental veneers may be a solution to consider. Porcelain veneers, or porcelain laminates, are thin shells of tooth-colored material. These shells adhere to the front surface of your existing teeth to improve their appearance. Veneers appear very natural and are resistant to staining from coffee, tea or even cigarette smoking. With proper care, veneers can last 5 to 10 years, or even longer. Homecare for veneers really is no different from regular recommended homecare. It is important to brush and floss daily and continue with regular hygiene appointments. The cost of veneers is generally not covered by insurance as the procedure is considered cosmetic. However, getting that Hollywood smile might just be priceless. 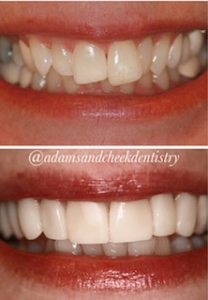 Dr. Adams and Dr. Cheek are both highly skilled in making porcelain veneers. Our dental lab is right next door and always available for custom shading the day of delivery. We would be more than happy to set up a consultation for porcelain veneers or any of the other cosmetic procedures we offer here at Adams and Cheek Dentistry. Please call us at (919)866-1360 to set up an appointment today or click here to schedule online.